The British weather is a fickle friend, just ask anyone who left their laundry on the line in a blaze of sunshine, only to find themselves pinned down in the supermarket carpark by a cloud burst of epic proportions that seemed to have snuck out from behind a neighbouring tree. But if you play her fair, and keep a watchful eye on the window even the gloomiest of days sometimes springs a brief window of opportunity to hustle your toddler into her newest jumper and sneak out for some photos. Kitty’s hoodie has been knit since before Easter, and buttoned shortly thereafter but as my abilities with photoshop do not stretch to the computerised removal of spaghetti bolognese sauce from knitwear, it’s been tucked away in the knitting basket until after the pictures. As in the course of the photo shoot it survived pavement chalk, crawling under the patio table in search of a clothes peg and a determined bid to puddle stomp a rain-filled paint tray and was still clean enough to wear to nursery the next day, I think it’s going to withstand being Kitty-ised. It’s a Martin Storey pattern from Rowan’s Mini Classics in some Calmer that I recycled a while ago from a wrap cardigan I made for myself and never really wore. It’s knit almost to the pattern; I knit it all in one piece up to the underarms and then split it, rather than knitting each piece separately, but other than that I don’t think I made any other changes, it’s a miracle of pattern following I know. 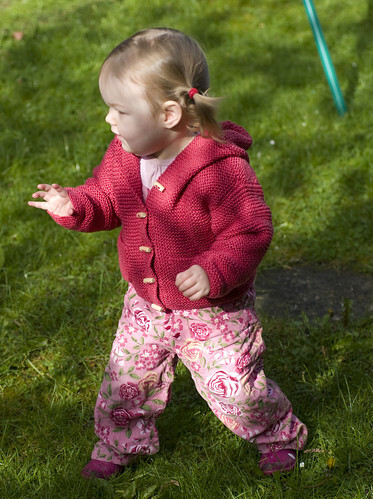 The Calmer is a cotton/polyester mix that’s soft and stretchy and wonderful and it’s a complete mystery to me why Rowan have decided to discontinue it because it’s just perfect for children’s knits and nothing they currently produce is in any way similar. Oh well, I’ve probably got enough left from my recycling for another jumper for Kitty, always assuming she doesn’t grow too fast. Mademoiselle’s latest growth spurt seems to have coincided with a speed spurt; this girl clearly takes after her father because she can be properly fast when she wants to be. I was trying to play around with some of the top tips from BlogCamp for taking interesting photos, but most of the time it seems to be a challenge to keep up with her long enough to get things in focus. 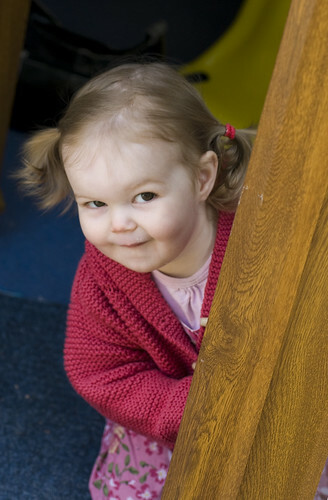 This is my favourite photo of the day, we were playing hide and seek behind the patio door and she has such a look of gleeful mischief you know she’s plotting something and wondering whether I’ll notice! I’ve taken easily a few thousand photos of Kit since she made her arrival 19 and a bit months ago and I like most of what I shoot but I want to get better. I’m also a firm believer in taking the hint when the universe gives you a massive nudge in the right direction. 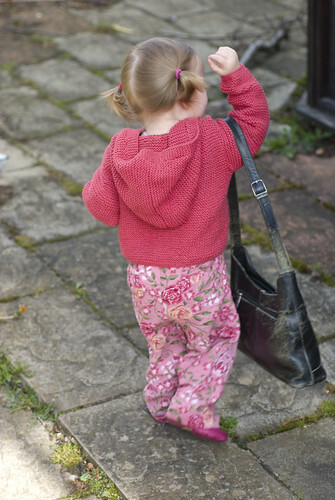 For example, when two bloggers whose blogs I follow and photos I love decide to band together to run a photography e-course focussing on taking pictures of your children…. Enter Capturing Childhood, run by the Kats of Slugs on the Refridgerator and Housewife Confidential. I’m all signed up and the course starts at the end of May. I can’t wait. 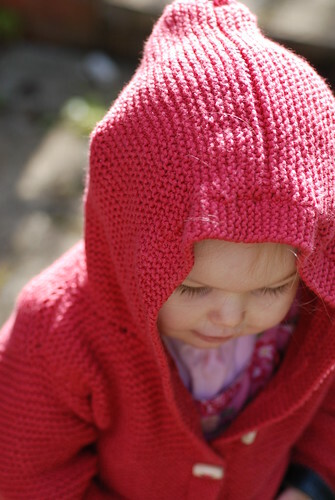 Size: 2 years (the second largest size on the pattern). Alterations: Knit in one piece to the underarms and then split for the top sections. Time to make: a month of picking it up and putting it down again to knit it, then another week to find the buttons and get around to sewing them on. Would I make it again: Possibly, the Calmer is what makes it work and I think another yarn substitution would make it too heavy to be comfortable for Kitty to wear if it were pure cotton. Perhaps in a nice wool for the winter. I’m at the upper end of the pattern scale anyway.